St Martin's Hospital was originally erected as a war memorial to commemorate those who had served in World War One. The hospital was named after St. Martin of Tours as the 11th of November (Remembrance Day) is his feast day. On 28 November 1922 the hospital was officially opened and dedicated by the then Governor-General of Australia, Lord Forster. St Martin's House is a heritage listed former hospital located at 373 Ann Street, Brisbane, Queensland. It sits within the grounds of St John`s Cathedral, Brisbane. St Martin's War Memoral Hospital, to be erected on the high ground adjoining St John's Cathedral, promises to crystallise in indestructible stone a trinity of noble ideals, religious, patriotic, and philanthropic Already there has been a generous response to the appeal for funds which are to carry out the work. But much more is required. Towards this a vigorous campaign is being organised throughout the diocese on St. Martin's Day, an effort that should enlist the interest and win the support of all who wish to see this admirable project successfully carried out. 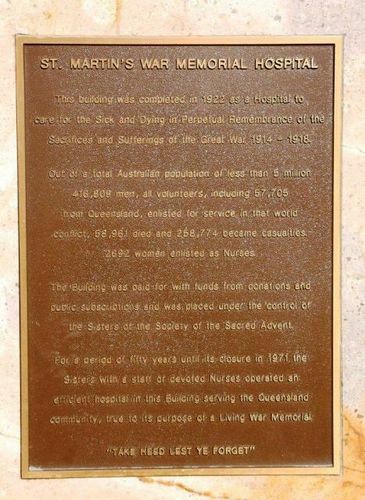 The Central Committee urges that the appeal is national in its incidence, for the object is to give to Queensland a real, living, perpetual memorial to the part her soldiers played so splendidly in maintaining the world's freedom. 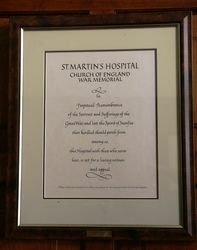 St Martin's Hospital will constitute a great monument for the honoured dead. It will express the public devotion to that cause for which they gave their last full measure of devotion. In its beneficent work it will be an inspiration to unselfesh deeds that, living in the hearts and minds of the coming generations may lead the nation on to better things. The Brisbane Courier (QLD), 27th August 1921. This building was completed in 1922 as a Hospital to care for the sick and dying in perpetual remembrance of the sacrifices and sufferings of the Great War 1914 - 1918. Out of a total Australian population of less than 5 million 416,809 men, all volunteers, including 57,705 from Queensland, enlisted for service in that conflict, 58.961 died and 258,774 became casualties. 2692 women enlisted as nurses. The building was paid for with funds from donations and public subscriptions and was placed under the control of the Sisters of the Society of the Sacred Advent. In perpetual remembrance of the sorrows and sufferings of the Great War and lest the spirit of sacrifice then kindled should perish from among us. This hospital with those who serve here, is set for a living witness and appeal.